As we approach the first 600 days into the Donald J. Trump Presidency it’s again time to assess his accomplishments. What better way to perform this analysis than to compare his results to the prior Administration’s – President Barack H. Obama’s? On Friday former President Barack Obama gave a speech in Illinois where he was critical of the current President while never referring to President Trump as “President”. Obama then took credit for President Trump’s economy. As we approach President Trump’s first 600 days in office, we decided to compare his economic results to those of Obama for the exact same time period. We start with the stock market results. After President Obama was elected President the already low stock market crashed. When Trump was elected the stock market skyrocketed. The markets are a gauge of the economy and include expectations of the future. The day President Obama was elected President, November 4th, 2008, the DOW stood at 9,625. Immediately however, the DOW began to tank and by March 9, 2009, the DOW could go down no further as it landed at 6,547 for a decrease of more than 30%. Since President Trump was elected President the DOW tied the record for the most all-time closing highs in a row. In January of 1987 President Reagan saw the DOW increase to new all-time highs a record 12 days in a row. In February of 2017, President Trump matched Reagan’s record. The DOW reached its fastest 500 point increase between major milestones under President Trump. In January of this year the DOW surpassed 26,000 and six days later the DOW surpassed 26,500. Under President Trump the DOW has seen the fastest 1,000; 2,000; 3,000; 4,000; 5,000; 6,000 and 7,000 point increases in DOW history. No similar records occurred during the Obama years. Also, President Trump didn’t ride an Obama wave, the DOW under Obama went down in 2015 and stayed relatively flat until the 2016 election. The Russell 2000 is a major index of US small cap stocks recognized throughout the financial industry. The 2000 companies in the Russell 2000 are the bottom 2000 companies in the Russell 3000. These companies have seen incredible results as well since President Trump was elected President. The Russell 2000 reached 31 new highs in 2017 and this year already has reached 30 new all-time highs. The Russell 2000 never reached a new high in Obama’s first 600 days and only reached 3 new all-time highs in his entire first term! The other major indices are all the same, recording massive gains since President Trump was elected into office with dismal results in Obama’s first 600 days in office. President Trump however last quarter reached a GDP of 4.2%. In his first 600 days President Obama increased the amount of US debt by $2.8 trillion. 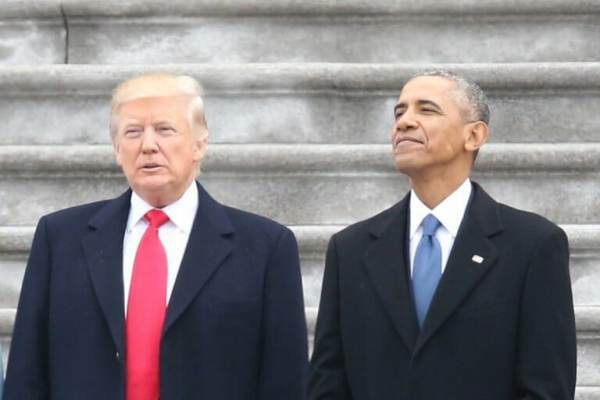 In his first 600 days, in spite of increasing interest rates and the massive debt that he inherited, President Trump’s debt increase is around half that of Obama’s ($1.5 trillion). As a result, the debt to GDP ratio is going down. 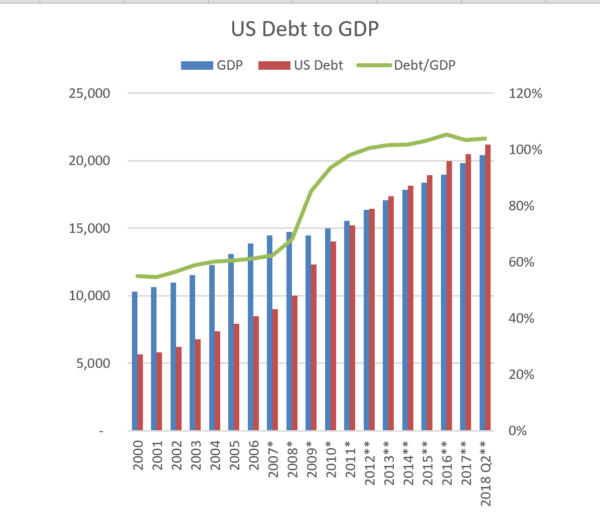 President Obama increased the US debt to GDP ratio by 40% from around 60% in 2009 to over 100% in 2016. With his increasing GDP and slowing of debt increases, President Trump has managed to decrease the debt to GDP ratio in his first 600 days in office. This is a very good result that is rarely mentioned by the MSM. Speaking of jobs, I looked at the ADP report yesterday, Tammy, 830,000 new manufacturing jobs in the last 19 months. The prior 19 months, 26,000. Trump bested Obama by 804,000 manufacturing jobs since taking over White House when compared to the 19 months prior to the 2016 election! These high paying jobs are the same jobs that Obama said would never come back. In President Obama’s first 600 days in office, the US lost over (4.4) million jobs. In President Trump’s first 600 days in office, the US has gained over 3.4 million jobs. In summary, in every major economic category, President Trump’s economy is moving in the right direction and is mostly record breaking. In comparison, President Obama’s economy his first 600 days were some of the worst months in US economic history. President Trump has reversed the Obama economic nightmare.